In mid-2017, a prominent senior living community developer approached SKS Studio to help them rethink senior living communities, specifically assisted living landscape design. What if SKS Studio designed a senior living community, whether independent, assisted or hybrid, like a destination resort? Designing exteriors for a senior living community means people can enjoy our work every day compared to vacationers who admire it for a week. Destination resort landscape design we know very well. Senior living communities are a new venture for us and we are very excited to bring our landscape architecture experience to this project. This is our story, part one, wrapping our heads and pens around this tremendous challenge and unique opportunity. In future articles, we hope to share our learnings and outcomes as the luxury retirement living industry takes shape while we navigate our way infusing elements of the hospitality industry into senior living. Our history as master planners and landscape architects for luxury hospitality markets has prepared us well to transform a plot of land using nothing more than our experience and imaginations. Great outdoor spaces, whether they are a beach front in the Caribbean or the ultimate modern hotel in Dubai, need to create deeply emotional connections between the visitor, the indoors and a magnificent exterior. Designing for a livable community needn’t be any different. 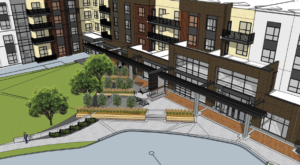 A single-family residence, a multi-family complex and even an assisted living community deserve the same emotional connections between people and environment. Our first step in this process was to define the communities for which our designs will impact lives. For example, single family communities often emphasize open park spaces designed for children. It is a given that family-centered resorts emphasize child-friendly spaces. So why wouldn’t a senior residential facility also consider families and children? Perhaps not as residents, but certainly this broader community may include adult children and grandchildren in their designs as an encouragement for visiting and feeling at home. Creating a new definition of community for a senior residence is our first variable in changing our design mindset. The assignment presented to SKS Studio goes well beyond our imagined environments where visitors rest, relax and revive. Unlike resort hospitality design, these types of projects have the potential to change lives for residents of the community, especially residents with dementia. According to experts in residential care for those with dementia, “home” is more of a feeling than an actual place. One of the first implications of dementia is the feeling of being lost, to the extent that someone with dementia, even though they may be at home, won’t feel at home at all. Caregivers for those with dementia often try to surround patients and residents with familiar elements from their prior home or earlier life experiences. Patients and residents with dementia are always seeking to go home, regardless of the reality of being able to do so. As designers of exterior experiences we must ask ourselves, “How can we help residents with dementia feel at home?” We must find ways to create familiarity, comfort, safety and warmth in an exterior landscape design so residents feel at home, longer. While this task seems daunting, we are familiar with establishing emotional connections between resort exteriors and visitors that result in a memorable experience. 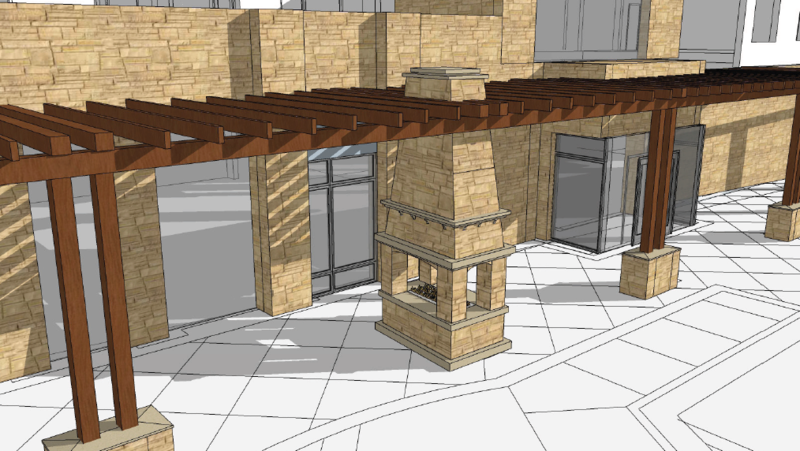 In all of our projects, our design team strives to tie elements of the greater environment into the exterior landscape. A cohesive feel helps the community or resort property feel “at home” in the area or region. For example, a Caribbean theme doesn’t flow with the elements native to Omaha, Nebraska. If we can create this same emotional connection for residents of assisted or memory care facilities we can positively impact quality of life. This is the newest and most exciting aspect of the task ahead… and one that we will continue to research and test new approaches. 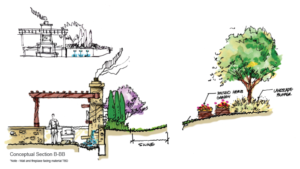 In our landscape designs we want residents to have daily, meaningful interactions with the environment. And, we want those interactions to be safe and accessible. Yet, at the same time we want these exteriors to be welcoming to all generations, in the same meaningful way. On the best day, we hope every visitor to one of our designed communities has a moment to reflect and delight in the environment around them. Whether this be a resident, a caregiver, a child or grandchild – all should enjoy their environment and hopefully create memories that last a lifetime. Our landscape architecture firm is excited about the road ahead. We have begun our project by immersing ourselves in this new industry while continuously calling on our deep understanding of environment, exteriors and experiences. We know that we have just scratched the surface of our learning opportunity and look forward to changing landscapes and lives in a positive way. In the end, we understand and appreciate that senior living community developers have sought out SKS Studio specifically because of our hospitality industry expertise and to help shape this new paradigm of senior community landscape architecture in new ways not seen in projects prior. Want to follow along? Click here to subscribe to our newsletter.